The Caviar Lady is an English translation of the Italian book ‘La Signora del Caviale’. The book takes place in a quiet fishing village on the Po, near Ferrara where prized caviar is harvested from the sturgeon. It is a simply written story told through the eyes of an innocent, Nellino, who is 12 years old at the start of the book. With the outbreak of WWII, things change in the village, including the disappearance of the caviar lady. The war becomes part of everyday life and the growing disillusionment of the once optimistic young Nellino. This tragic story of family, friendship, disillusionment, disappearance and survival amid the horrors of war is a simply written one, yet the important details seem to lie in what is unwritten. The once thriving sturgeon fishing/caviar industry on the Po is a part of Italian cultural history I did not know about. Another victim of the war. I would definitely recommend The Caviar Lady, in fact, I plan to read it in Italian next. Finding Rosa is part memoir, part history lesson, part detective work, about the author’s years of caring for her mother with deteriorating Alzheimer’s, while trying to piece together the history of her mother’s life. Complicating things, Rosa’s homeland no longer exists. Istria is now mostly Croatian, but also belonged to Austria, Italy and Yugoslavia all in rapid succession. The Istriani are described as the ‘forgotten Italians’, and the author learns of atrocities and ethnic cleansing, hundreds of thousands of displaced refugees, and unknown numbers missing or murdered by being buried alive in ‘le foibe’ (deep sinkholes). She makes several trips to Trieste and her mother’s homeland to visit relatives and interview ‘i rimasti’ (the remaining ones) and finds public records have been destroyed to hide the evidence of missing persons. Since I know a few Istriani, I knew about some of the things that happened in Istria’s history, but I did not know the extent of the horrors or the fact that displacement happened not once, but 3 times in the 20th Century. The Pink House and Other Stories is a collection of 15 short stories. Each of these stories stand on their own, but several of them are interconnected. 6 of the stories are about events surrounding a car accident after a Leonard Cohen concert and a writer experiencing a creative block post trauma. The stories are told from different perspectives; the victim, the driver, the passenger, making the connectedness less obvious at first, but apparent as you continue reading. 2 other stories center around an unlikely couple; a very pregnant woman and a man she meets in the library. I was left wanting to know more about them. The other 7 stories are not related. 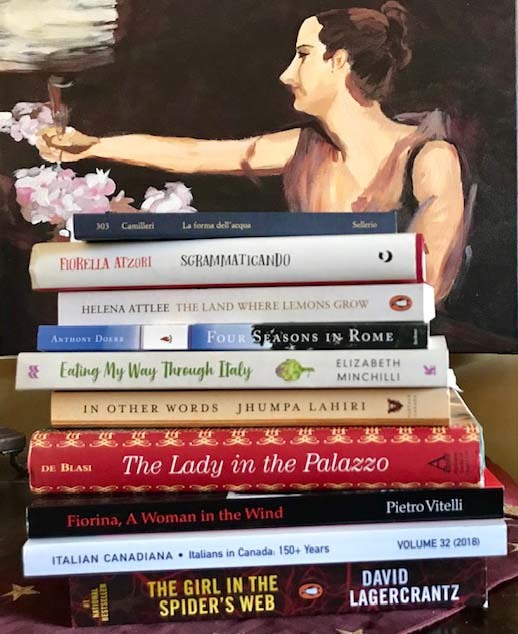 Most feature multigenerational Italian Canadian characters and deal with family relationships, love, aging and tension between generations. I could identify with many of the characters and situations. My favourite story in the book is about an octogenarian insistent on renewing his motorcycle license so that he can be ready at any time to drive anything and everything. This character reminds me of my own hard working father and other aging immigrants I know. I have already written a blog post about La Brigantessa, but I will include it here again in case you missed it! La Brigantessa is a novel of historical fiction which takes place following the Unification of Italy (1860’s), during a decade of turmoil. It was a time when law enforcement was often worse than the criminals and the law only applied to the wealthy. The main character, Gabriella Falcone, is a young peasant girl whose family work for the parish priest in a small village in Calabria. Her love has volunteered to fight alongside Giuseppe Garibaldi. When Gabriella stabs a nobleman in self defense, she is forced to flee knowing that her version of the facts will not matter. La Brigantessa has everything a great read needs…love, honour, class struggles, jealousy, betrayal, bravery, suspense, and even a ‘modern’ Calabrese Robin Hood. The story is told from the point of view of many characters, yet they are all so well-developed there is no confusion. Each character is given a detailed, credible backstory, revealing their individual struggles and motivations. I was emotionally invested in these characters-even the nasty ones! The attention to detail regarding life and customs in 19th Century Calabria transported me right there. For more of my book reviews on this blog, search the category ‘Libri’. Here are links to The Sicilian Wife, Bridge of Sighs and Dreams, Cristo si è fermato a Eboli, and Italian Street Food. My ratings are usually out of 5 peperoncini! I will leave you with Madame Gautreau toasting my smaller pile of books!